What do I need to take the exam from my personal computer? Once you complete payment, you will be provided with access to our web-based exam scheduler. From here, you can schedule your online exam. Alternatively, you may also elect to to take the exam at a local test center. Please note: You will need to have a webcam which can be positioned per the proctor's instructions (ie. a free standing webcam) and an Internet connection. How soon can I take my exam after I complete payment? If you wish to take your exam online (from your personal computer), a minimum of 48 hours is required from the time you schedule your exam (until you can take it). If you plan to take your exam at a testing center, a minimum of 72 hours is required from the time you schedule your exam (until you can take it). Please note: while it is possible to schedule an exam online or at a test center with less than 24 hours notice, we cannot guarantee availability in all areas. What countries are eligible to register for the exam through ITIL Prime? There is no restriction on countries when you register for an ITIL exam. All exams are now administered online from a personal computer. I thought an exam proctor was needed to take any ITIL exam. How is this accommodated for students who take the exam online? When you elect to take an ITIL exam online through ITIL Prime, a virtual proctor is included in the cost. You are required to have a webcam when you take the exam, and our proctor will monitor your exam progress to ensure compliance. Private training organizations have historically offered virtual methods of ITIL test taking to accommodate students in remote areas, and now we are offering it on a wider basis. Are the ITIL exams and certificates offered through ITIL Prime formally recognized by the ITIL Certification Management Board (ICMB)? Yes. Exams and certificates are issued by the ITIL Exam Institute, who is formally recognized by the ITIL Certification Management Board (ICMB). The ITIL certification you receive is identical to those issued by other ITIL Examination Institutes, such as ISEB or EXIN. How many days in advance do I need to schedule my ITIL Foundation exam? If you plan to take the ITIL Foundation exam, please allow for at least 48 hours (2 days) from the time you schedule your exam. This ensures enough time for a virtual proctor to be assigned to your online exam. During what days and hours may I take the online ITIL Foundation exam? If you choose to take the online ITIL Foundation exam, you may take your exam 7 days a week, between the hours of 8AM to 7PM (MST GMT-7 / UTC-7). Can I take the ITIL Foundation exam on a weekend? Yes. The online ITIL Foundation exam is available 7 days a week. If I take the ITIL Foundation exam online, how long does it take for me to find out if I passed? And how do I receive my certificate? Upon completion of the ITIL Foundation exam, you will immediately be presented with your results by the testing system. If you have passed, your actual ITIL exam certificate will be presented to you for download (if taken online) or for printing (if taken at a test center). What is the score required to pass the ITIL Foundation exam? The score required to pass the ITIL Foundation exam is 65%. Do you offer a refund if I decide not to take my exam after registering? We do not provide refunds for those users who register and decide not to take the exam. Is the ITIL Foundation exam considered "tricky", or can it be desribed as straightforward? Statement 1: An SLA is an agreement drawn up by the IT department which states what the customer may or may not do with his workstation. Statement 2: A Service Catalog describes accurately and specifically the IT services that the IT department can offer a customer. ITIL Prime contains similarly constructed question items in our APMG-endorsed practice exams. Are there professional requirements one must fulfill in order to qualify to take ITIL Foundation exam? At this time, only an examination fee is required to sit for the ITIL Foundation exam. Further ITIL exams, such as the ITIL Intermediate exams, have requirements which must be met prior to acquisition. Does this site offer exam preparation for the latest ITIL Foundation exam? The latest version of the ITIL Foundation exam is based on the ITIL Foundation syllabus (ITIL 2011 Edition). The syllabus is available for download directly in our "About the ITIL Exam" section. What is your general refund policy on purchased products? Due to the digital nature of our courseware and exam products, refunds are only offered within 24 hours of purchase, and only if the product has not been accessed. Are refunds available for unused ITIL exam vouchers? No refunds are available for unused exam vouchers. Once an ITIL exam voucher is purchased, there is no expiration date for when it may be used. After I purchase the online Bootcamp course, how soon does it begin? Bootcamp courses are available on-demand, so you can access the course whenever you choose to. Please allow 1 business day following purchase for us to finalize your new account. What type of knowledge or job experience is required to purchase the online ITIL Bootcamp? Bootcamp courses assume the student has zero knowledge of ITIL and its subject matter areas, and is designed to quickly ramp you up to a level of proficiency. There are no professional pre-requisites required for the ITIL Foundation Bootcamp course. Anyone can purchase the course. I purchased the online ITIL Bootcamp course, what do I need to access it? You can access the course using a web browser with the Flash plug-in. Is the Bootcamp course professionally accredited? Yes, online Foundation Bootcamp courses are accredited by the ITIL Examination Institute, CSME. Completion of the course grants the student 2 ITIL Expert credits. The course is also recognized by PMI, and 18 PDU credits are granted. Will I be able to view my performance within each ITIL management area, as well as by each practice test I take? Yes. Because ITIL Prime tracks question performance by test, as well as by management / function area, your results will be calculated on both. You will easily be able to view your real time performance for each area using the My Performance tab. Do the online practice tests provided by ITIL Prime have a time limit? Yes. In order to provide as realistic a testing experience as possible, you are provided with time limits which mimic the real exam for each practice test. A timer will be displayed during the test at all times, to indicate how much time remains. How can I be certain that the test questions and responses created by ITIL Prime are accurate? Test questions available to ITIL Prime subscribers are created and maintained exclusively for this service by course trainers and ITIL certified resources who are subject matter experts in the field of IT Service Management. All questions, answers, and explanations are reviewed by ITIL Prime team members for quality and accuracy before they are published. When you visit the My Performance tab, the first view you will see will be a chronological view of all your test scores. This chart will indicate which tests were taken, in order, and will clearly plot their points along a graph. After I take the real ITIL Foundation exam, how can I report my score to ITIL Prime? ITIL Prime encourages its users to report their results from the real ITIL Foundation exam. Users can report their results under the Account Status tab, or by visiting the Contact Us tab. ITIL Prime is very interested in hearing about your experience and results on the actual ITIL Foundation exam, and will keep your feedback 100% confidential. Can I view my test taking performance within each ITIL management area? Yes. 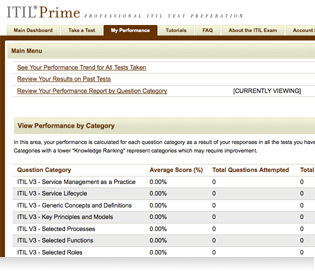 As you take practice tests, ITIL Prime keeps track of your performance within each ITIL management / function area. At any time, you can review your average performance when presented with specific subject matter, and are even provided with a Knowledge Ranking for each area. The lower your Knowledge Ranking, the more study is recommended for a specific subject area. When taking a practice test through ITIL Prime, will I be able to mark questions for review, and return to them later? Do I need to download or install any special software in order to user ITIL Prime? No. ITIL Prime’s testing engine is designed to work solely with your web browser, without the need for additional downloads, installations or plug-ins. Should I solely rely on ITIL Prime to pass the Foundation exam? Although it has been reported by users that ITIL Prime was a critical component of their Foundation exam preparation, we recommend acquiring the appropriate study guides in addition to relying on our practice exams for best results. Because ITIL Prime identifies your aptitude in each ITIL management process, this information is very beneficial when choosing where to focus your offline studies. What features will I have access to when I register for the ITIL Prime practice exam system? By registering for ITIL Prime practice exams, you will have unlimited access to all features of the system for the full term of your subscription. This includes all testing content, reporting and performance tracking, and premium support. What types of payment methods can I use to register my account for ITIL Prime, and is it secure? Subscriptions are payable using all major credit cards, PayPal, or eChecks. Additionally, we accept payments regardless of the country of origin. Is any of my personal payment information stored by ITIL Prime? The Forgot Password link (located in the top corner of the screen) will dispatch login information to the email address you registered with ITIL Prime. ITIL Prime is owned and operated by SSI Logic. Welcome to ITIL Prime, one of the most realistic online exam preparation services available for the Information Technology Infrastructure Library Certification Exam. Our testing content is created by subject matter experts and instructors who are veterans in their field of expertise. All of SSI Logic's content is developed in tandem with qualifie subject-matter experts in adherence to our testing Content Development Process (CDP). Our process serves to minimize the risk of content issues related to quality and accuracy; and increases our platform's ability to reflect objective, consistent, test taker performance. Below are general steps included in our CDP methodology. The tools provided within this site are endorsed by the APM Group, ITIL's official accreditor. No guarantee, warranty, or representation is made that you will pass the ITIL Foundation exam as a result of using this website, nor with regard to the general content of these pages. To learn more about our ITIL examination prep material, we recommend you visit our page on obtaining your ITIL certification online, for both the Foundation and prometric ITIL versions.